My girlfriend is just looking into getting herself a nice mountain bike. I of course wanted to help her get the best bike she can for what she wants to do. This is a list of the bikes that would probably be best for her and any other woman reaching within her parameters. 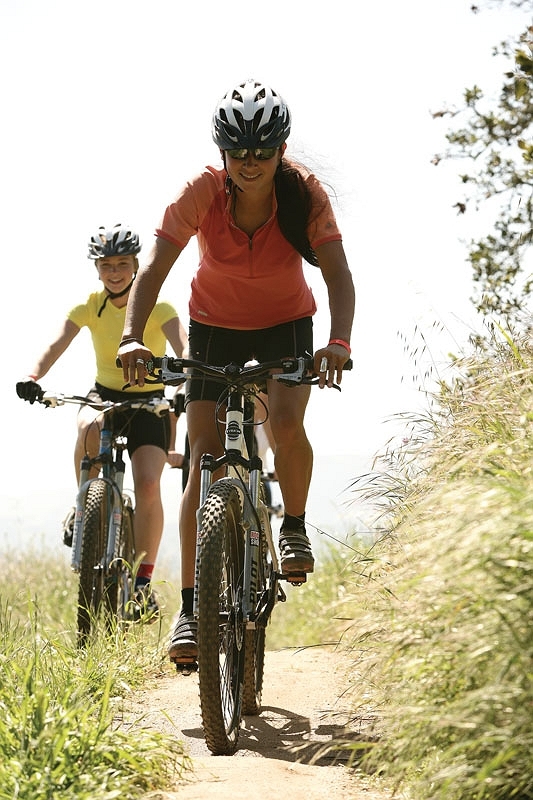 What she is looking for is a bike that she can take on moderate trail riding and not down hill crazy single track rides. The main things that this bikes will have is the price, weight, look, components, and tire size. You will see a lot of these bikes will have 29″ tires this is only because I prefer them and so does my girlfriend. Let’s kick things off. The Trek Marlin is a really cool looking bike just because of the nice color scheme it has going on. It is a 29er and that gives it that great mountain bike look. A couple great things about the Marlin is it comes with disc brakes instead of rim brakes. The brakes are mechanical instead of hydraulic so not the best but still very functional. It is a hardtail and you will see that all the bikes on this list will be hardtails. It has a mix of lower end Shimano and Sram components. The fork has 80 mm travel. 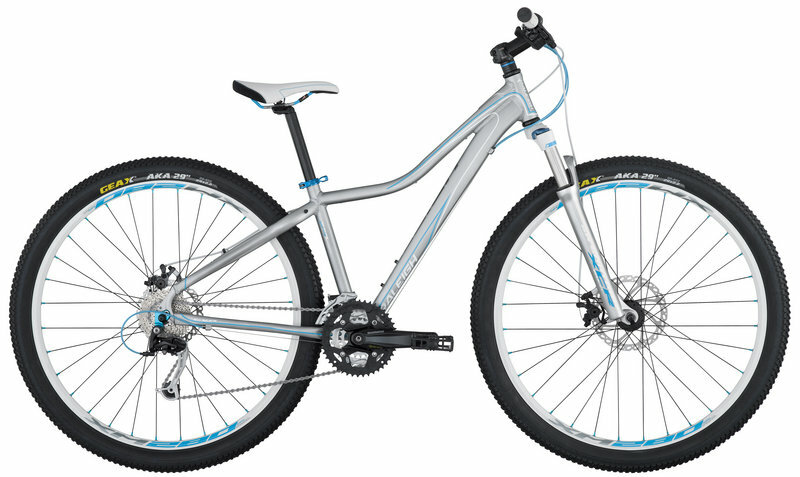 The frame is Trek’s Alpha Gold Aluminum. I don’t have a definite weight on this bike but from customer reviews it is a little heavier than they like. The bill of the Trek Marlin is $679.99. This bike has the look of a specialized with the way the frame curves as it does. Some people like this newer look while others still like the more straight line geometry of a bike frame. This is supposedly meant to be lightweight and easy for girls to maneuver. 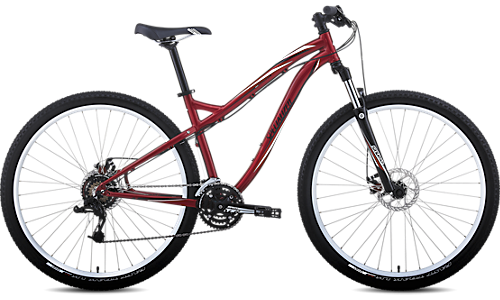 The wheels are again 29″ and they come with disc brakes also. In addition the disc brakes are also mechanical. The fork has 80 mm of travel. This bike has much the same components as the Marlin if not completely identical; with a mix of Shimano and Sram. The frame is also aluminum as we will probably see in all these bikes. The Myka family has many options aside from this particular model, and ranging from $470 – $990. The Myka Sport Disc 29 costs $690. I think that personally this may be my favorite bike out of the list. I don’t know why but it has a really cool look to me and while it is a big name in cycling it is not so huge in america. To have one of these you would probably not see someone else riding the same bike. The odd angle of the top tube really intrigues me also, but that is all preference. It has mostly Shimano Alivio components which may still be low-end but still better than the components on either of the bikes I have shown previously. It again has mechanical disc brakes, but while the rear disc is again 160mm just like the previous two, the front brake is 180mm for more stopping power. The fork has 80mm of travel. 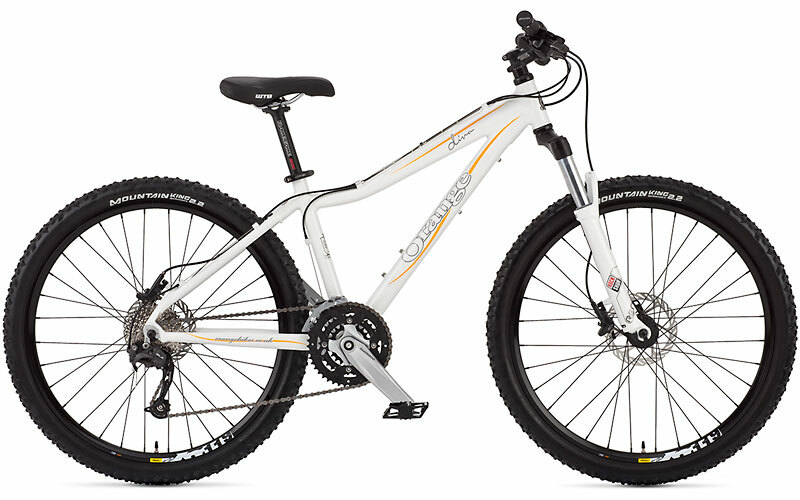 With, as the name suggests, 29″ tires. The frame is of aluminum again. The end price for this bike is $739. 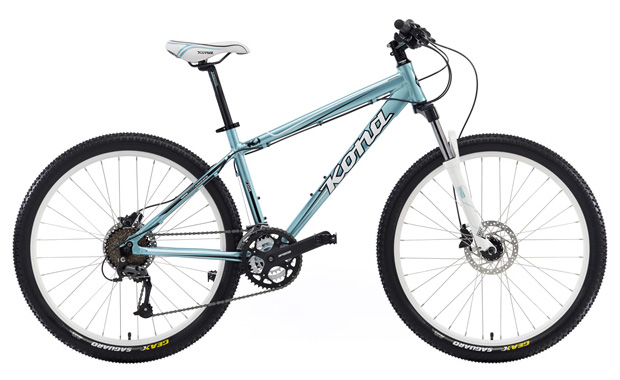 The Kona Tika is a great mountain bike with a look and color very similar to the Trek Marlin I have put at the top of the list. Nice straight lines as far as the frame, which is also made of aluminum. Again this comes with 160mm disc brakes but the plus is that they are hydraulic making them that much nicer. Again pretty basic components mostly coming from Shimano. Not up to par with the Raleigh; equal or even better than the Trek or Specialized. Also the wheels on this girl is just 26″ which in my opinion is not great but you may prefer them. With the smaller wheels comes a smaller frame so the weight is lesser on this bike than the others. The Kona Tika costs $755. 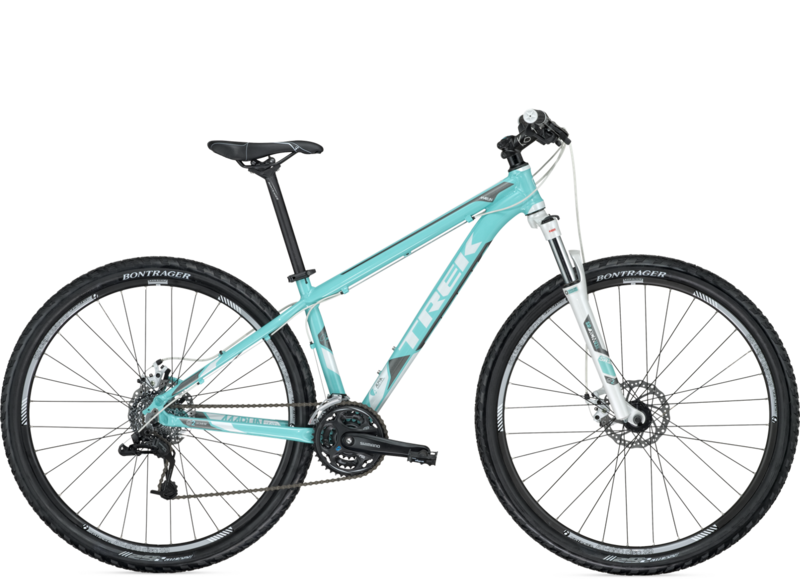 This is the most expensive bike on this list but it is the cheapest women’s mountain bike that Orange offers. I think this is a little better than the rest but it depends on what you want and of course when you pay more you get more. The components are Shimano Deore so a step even above even the Raleigh and two steps above the rest. The wheels are only 26″ inches but again that is preference. The biggest advantage is that the fork has more travel with and optimum travel of 100mm. This could be worth it to you but you must think about how you will use that travel because you will be paying for it. 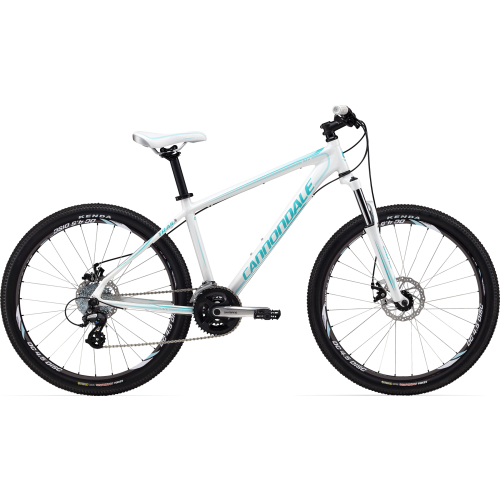 The frame is of course aluminum and the has a nice look with the slightly augmented top bar for the feminine riders. It comes with 160mm disc brakes. The final price for this bike is $899.99, which is over 100 more than the other bikes. I really like the look of this bike with the deep purple you can get it in or if you want a lighter ride it comes in white. This comes with mechanical, 160mm disc brakes. Again low-end Shimano components on this ride. The wheels are only 26″ but the fork has 100mm travel. This is really a pretty great bike for the price. The frame is without a doubt aluminum. The price tag comes in at $610. The list could go on and on but those are just a few of the ones that I am looking at and I will definitely have a post of the one that she picks and the reasons. I hope you find what you are looking for. If you want me to review more just leave a comment or visit my Suggestions Box! tab and tell me just what you want to hear from me.